The State of Kansas is named for the Native American tribe called the Kansa or Kaw. One of the tribal leaders, Hard Chief, was said to take a hard line when negotiating for his people. This Kansa chief was one of three Kansa tribal members to sign an 1825 treaty that established villages in present-day Shawnee County. His village was located on a bluff high above the Kansas River. Because of its location, Hard Chief’s village survived the floods that destroyed other villages and today is the only intact archeological site of its kind. A few eyewitness accounts of the site have been preserved in historical records. Those records, along with archeological studies, offer a rare opportunity to learn more about the Kansa (Kaw) people in the 1800s. For generations, the Kaw territory spanned much of northeast Kansas. The 1825 treaty limited lands for the 2,400 members of the tribe. Separate communities were named after three leaders. American Chief’s Village, the smallest of the three, and Fool Chief’s Village, the largest, were located to the north and in the lowlands. Hard Chief’s Village contained 50 to 60 earthlodges for its 600 residents. 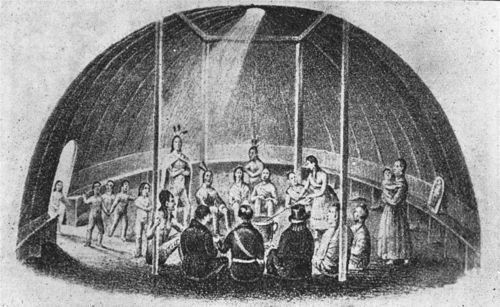 The treaty promised the Kaw access to a trading post, government agents, blacksmiths, interpreters, and other services. During the spring and fall each year, the Kaw went on hunting trips in the west. When they returned to the village, the Kaw brought furs and hides to trade. Because there wasn't a mission school in the area, some of the Kaw children were sent to the Shawnee Mission near Westport, part of present day Kansas City. After returning from the school, several of these children died. Hard Chief refused to let other Kaw children return to the mission. In 1834, the U.S. Ind ian agency closed its local office and with it many of the services. A number of Hard Chief’s followers moved west, possibly to be nearer to buffalo country. When a wagon train traveler stopped to view the village in 1839, he discovered that the inhabitants were away hunting. The villages were abandoned in 1848 after another treaty was finalized. The remaining Kaw residents were removed to the Council Grove area. Hard Chief died sometime in the 1860s. Allegawaho was chief to the Kaw people when the last of their land in Kansas was relinquished in 1872. The 194 remaining Kaw were removed to Indian Territory, present-day Oklahoma, where today the 2,861 members of the Kaw Nation live. The 1987 archeological excavation on the site of Hard Chief’s village discovered at least 15 possible houses and revealed that the Kaw were dependent on trade goods. Items discovered include iron axes, a drawknife, a metal bracelet, projectile points of brass and iron, glass beads, glass bottle fragments, and clay pipe fragments. Animal remains include a horse, deer, dog, bison, turtle, and mussel shell. Hard Chief’s village offers a rare combination of written records and archeological resources, giving researchers a better understanding of this Kansa village.